Faux Pas Calendars For 2019 Are Here! Every year should have foxes in it. 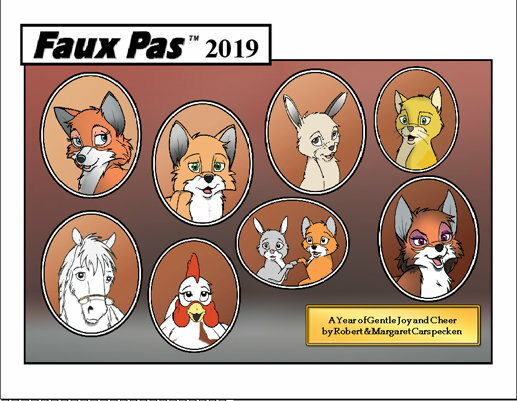 The 2019 Faux Pas calendar features the wild and domesticated animals from the popular online comic strip with all new artwork, including some fan-favorite scenes which have been revisited by popular request. This edition is filled with joyful adventure and enough foxy fun to last the whole year 'round. Whether for yourself or as gifts for your favorite friends, this calendar offers happiness through 2019 and will be treasured for years to come. It's a gift you can enjoy all year long! Please be aware that overseas shipping may be wildly expensive. PayPal will calculate postage during checkout. Decide which item(s) you want. E-mail us by clicking here. Send us your real (legal) name and shipping address at the time you place your order. S&H is $6.00 in the U.S.no matter how many items you buy. Buy more stuff all at once, and save on postage! Let us know which item(s) you want by title, and how many of each (if you want more than one of any particular item). We will hold your order for 14 days from the date we receive your e-mail. If you need more time, say so; we're easy - but we will no longer hold orders indefinitely! Make your check or money order out to Margaret Carspecken. Please: include the title(s) of the item(s) you are ordering with your payment. We need your real name and address for shipping at the time you place your order. By 'real' name we mean your legal name. The online community may know you universally as Fuzzy Brighttail or ilkme2@aol.com; but until the Post Office perfects virtual shipping, we need your correct name and address at the time you place your order. Sorry for the hassle; but each returned package costs us money. We can't keep re-shipping packages at our expense and maintain our image as poor starving artists...!